I love to get practical gifts – filters for my Brita, a Sonicare toothbrush, argyle socks, a book I’ve been wanting to read (The Outliers by Malcolm Gladwell). I find it so satisfying to receive these things, knowing just how useful they will be. One of my gifts this year from Andrew would certainly fit the practical category, but it’s also just downright gorgeous and luxurious. 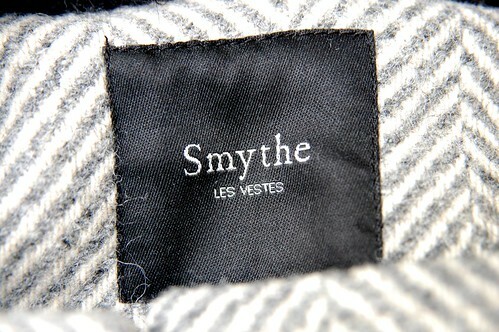 A few weeks before Christmas, I came home to find this Smythe coat hanging off the blackboard in our living room. Not only is it Canadian designed, but it is also made in Canada. This coat has been crafted with a level of workmanship that is impeccable. I’ve been wearing it every single day since I received it and it is flawless. Every little detail is perfectly executed from the vented elbow pads, the fur-lined hood and the heavy metal closures. Plus, it fits me like a glove. Winter just doesn’t seem that bad when you get to wear a coat like this. Your coat looks just great!! ooh! I want to see the hood! You’re right! Winter is actually delightful with the gear that you love! i was gonna say! i saw you quickly at the city of craft wearing this coat, and i love it!! Oh that herringbone coat is a beauty. You are so lucky! So pretty! Do you know what store it was purchased from? Your honey sure is good to you. What a super sweetie to give you such a fine coat to keep you toasty and warm throughout the winter. Everything about the coat is beautiful but a really LOVE the vented elbow pads. They’re pretty fantastic.